The kettle began it! Don’t tell me what Mrs. Peerybingle said. I know better. Mrs. Peerybingle may leave it on record to the end of time that she couldn’t say which of them began it; but I say the kettle did. I ought to know, I hope? 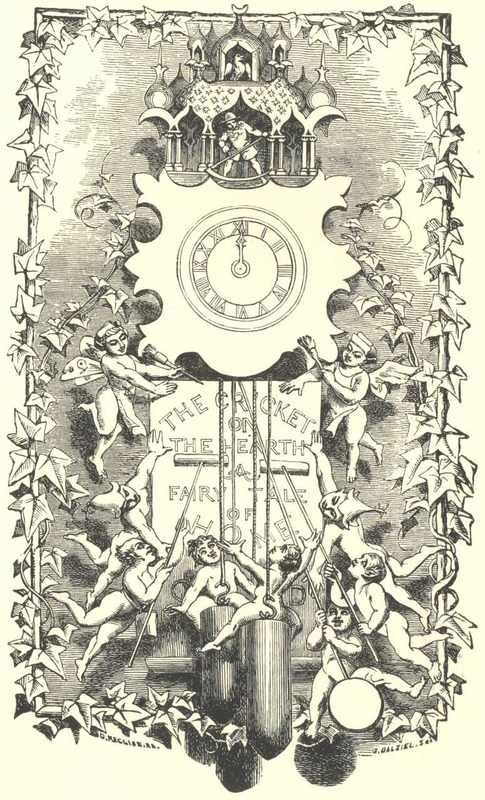 The kettle began it, full five minutes by the little waxy-faced Dutch clock in the corner, before the Cricket uttered a chirp. 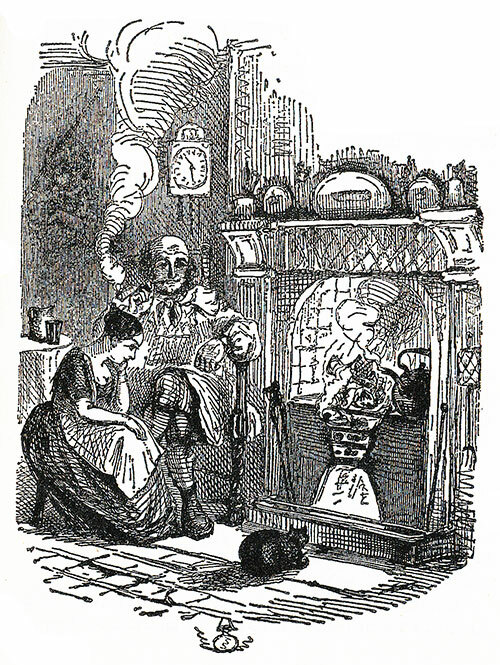 It was pleasant to see Dot, with her little figure and her baby in her arms: a very doll of a baby: glancing with a coquettish thoughtfulness at the fire, and inclining her delicate little head just enough on one side to let it rest in an odd, half-natural, half-affected, wholly nestling and agreeable manner, on the great rugged figure of the Carrier. It was pleasant to see him, with his tender awkwardness, endeavouring to adapt his rude support to her slight need, and make his burly middle age a leaning-staff not inappropriate to her blooming youth. The little house is blessed by having a resident Cricket which lives on the hearth and chirps merrily when all is well. Oh, yes! John remembered. I should think so! But this contented little household is about to be shaken to its core. A stranger arrives who seems to disturb Dot’s usually cheerful state of mind. It was a loud cry from the Carrier’s wife: a loud, sharp, sudden cry, that made the room ring like a glass vessel. She had risen from her seat, and stood like one transfixed by terror and surprise. The Stranger had advanced towards the fire to warm himself, and stood within a short stride of her chair. But quite still. The stranger’s arrival disrupts the happy home and the lives not only of John and Dot but of several of their friends and neighbours. Will the Household Spirit in the form of the Cricket on the Hearth be able to restore harmony and joy to all? First off, Christmas doesn’t feature at all in this one! Instead the day of celebration we’re heading towards is the first anniversary of the wedding of John and Dot, and the story focuses on marriages between older men and young girls. John loves Dot with all his heart and has done ever since she was a child. (I know, creepy, but it seems to have been relatively normal back in those times – look at Knightley and Emma.) The question that John belatedly is forced to consider is, can little Dot possibly love him in the same way, or has he been unintentionally cruel in persuading her to devote her youth to him? It has never before occurred to him that her heart may have prompted her towards a man nearer her own age. The stranger is the catalyst for this dark night of the soul for poor, kind, honest John, but to take the point further and show another side to it, Dickens includes another couple about to be wed where the age difference is even greater and the bride is being more or less forced into the marriage by her mother because the bridegroom is wealthy. The story takes an age to start. It’s about three pages before that kettle mentioned in the first paragraph finally comes to the boil, and then we have to fight through pages of sugar-sweet descriptions of the happy little home before things take off. 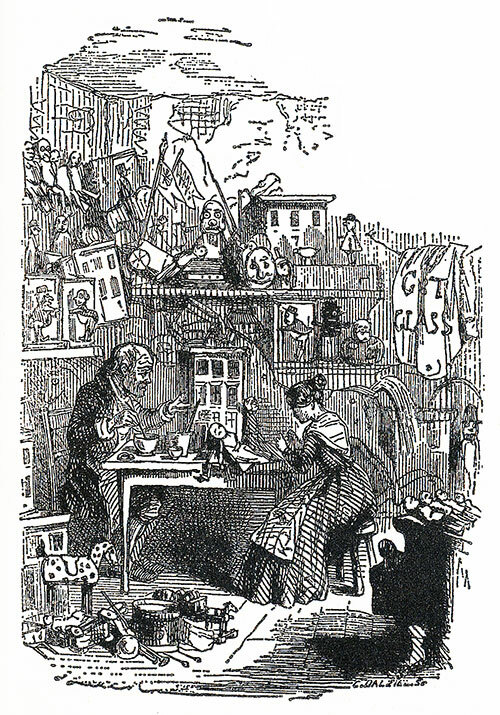 But once it gets going, it has all Dickens usual mix of humour and pathos, and some typically quirky and enjoyable Dickensian characters. John is lovely, and Dot grew on me after a shaky start. Mr Tackleton is the villain of the piece – the older man who is about to marry a young girl he knows doesn’t care for him in the least, he’s also the mean and nasty employer of the other two main characters, dear old Caleb the toymaker and his blind daughter Bertha. Plus there’s a lovely dog called Boxer who’s a great character in his own right, adding much fun to the proceedings! It’s novella length, with plenty of room for jealousy, self-doubt, sorrow, generosity of spirit, joy and, of course, redemption. I enjoyed it very much and was left feeling pleasantly uplifted. So despite it not mentioning Christmas, I reckon it still counts as appropriately seasonal, being full of goodwill and joy to all men (and women) (and dogs). Such a delightful review! It makes me want to pick up a Dickens and read it right away. It’s been a while now. Dickens always takes me back to school where I was fortunate to study English literature. I was put off Dickens by my experience of reading Great Expectations at school, but your post has successfully made me want to pick this up! It sounds lovely. I wasn’t going to say that… but I would take the cricket outside. I confess I’m not much of a Dickens fan but this does sound good. I enjoyed your review very much. This one sounds much more enjoyable! Terrific review and loved the illustrations again. I want to read this one now! Great review! I’d like to read this one, just to see what happens. Absolutely not! 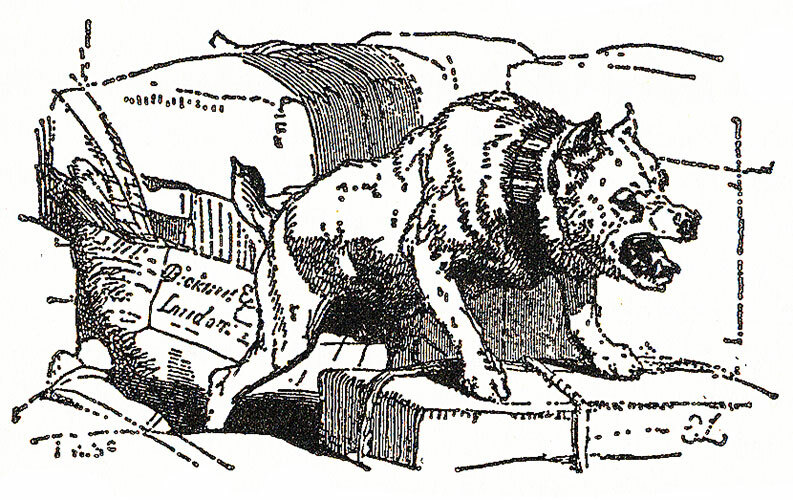 Nothing bad happens to the dog at all – he’s exactly the kind of dog softies like you and I would want in a story! 😀 It always reminds me that the things we decide are “wrong” are just that – decisions. The Victorians would be as horrified by lots of the things we think are “right” as we are about them. 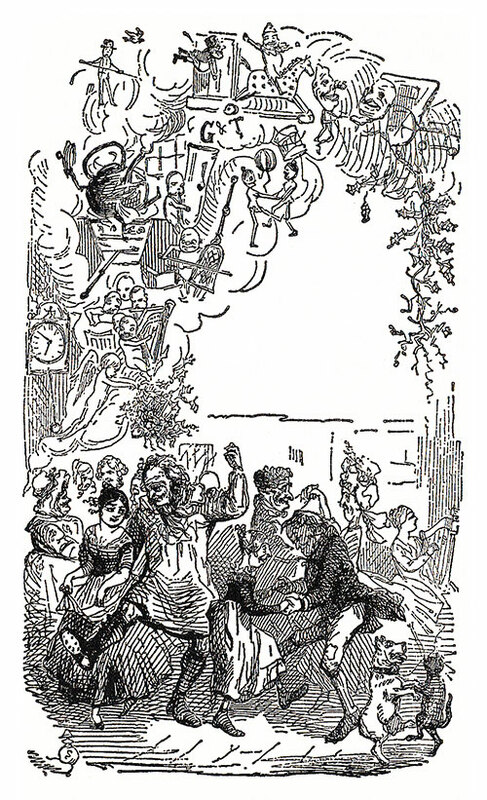 I was glad Dickens showed both sides – a love match against a forced marriage. Your last sentence had me chuckling, but then I remembered there was often no goodwill toward women, so maybe I should be more serious! Sounds like a winner, even though it’s not really about Christmas. 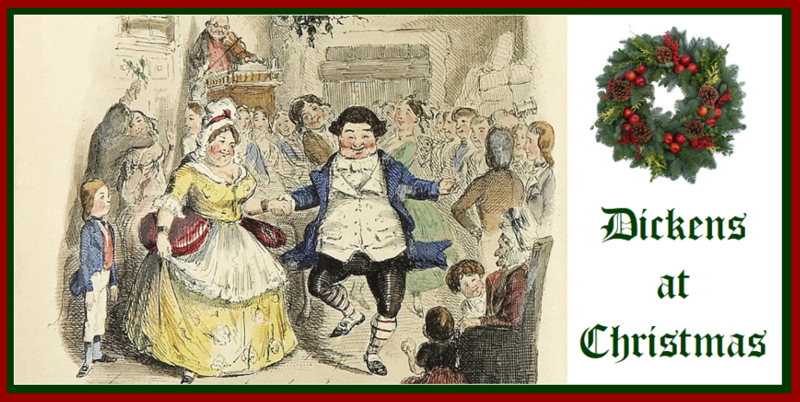 I’m going to pick up the Christmas Dickens collection in my library right now! Well even with the absence of ho ho hoing this sounds like good Dickinson fare… interesting subject matter too good that someone was considering all those or young girls forced into marriage with old blokes! Yay! I just checked my shelves and The Cricket is there, buried (unread) in a collection. I look forward to reading some Christmas spirit. Warm thoughts to you and your family member in their illness. FF, I am really happy to hear this one was more uplifting than the last! This one was lovely, thank goodness! But I’m beginning to see why A Christmas Carol is the famous one – the others aren’t really in the same league, on the whole.